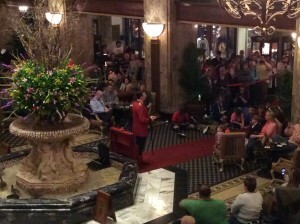 Some of the members of the Not-So-Sweet tea club recently went to Memphis and we had the pleasure of enjoying Afternoon Tea at the Peabody. 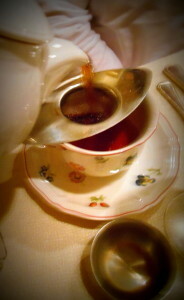 Tea is served in Chez Phillipe Wednesday through Saturday from 1:00 to 3:30 p.m. Advance reservations are a must. 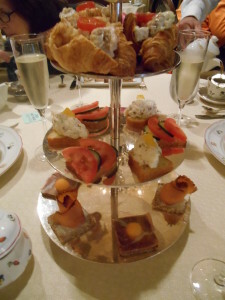 They offer a proper three course tea consisting of savories, scone and sweets for $30. The $40 option will get you a glass of Louis Perdrier Brut. 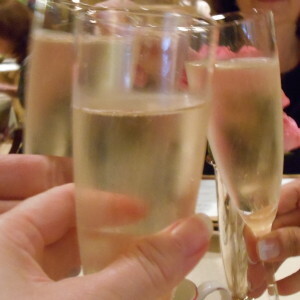 We didn’t want to miss out on one single part of the experience so we went for the sparkling wine. Our tea started with a toast to good times and good friends. And, just so you know they also offer a “Little Duckie” tea for children 12 and under for $24. You might miss the entrance to the restaurant if you’re not looking because it’s tucked away behind the enormous bar creating a private environment in the middle of a very busy and popular lobby. The table was set with Villeroy & Boch Petite Fleur dinnerware, linen and a spray of pink roses. The first thing we ordered was our tea. It turns out the tea they serve is from the Republic of Tea which you can find in many stores including Starbucks but they did serve the loose leaf version. I had the Blackberry Sage. You first notice the sweetness from the fruit and then it finishes with a strong oaky taste. The sage component was very mild. The tea was served in a small 2 cup teapot and I was initially a bit concerned that just wouldn’t be enough. However, the trick was that they stuffed the teapot more than halfway full with tea leaves and just kept bringing out more hot water and refilling the pot so it never got weak and as fast as we were downing our tea it never overbrewed either. I even noticed real blackberries in the tea blend. Just delightful. 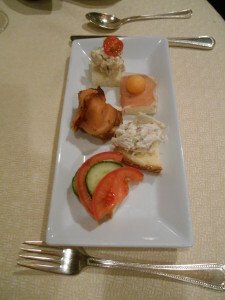 The first course was the savories and sandwiches. The prosciutto in particular paired well with the sparkling wine. The next course brought raspberry scones with orange marmalade and clotted cream. 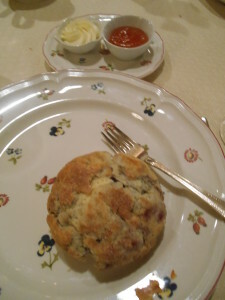 The outside was hard and crusty but breaking into the scone it was tender and cake-like. Scones are the staple of a good afternoon tea but the best feature can be the toppings. I’ve always said that scones are a good jam delivery system. In this case, they did a fine job of delivering the cream and marmalade. 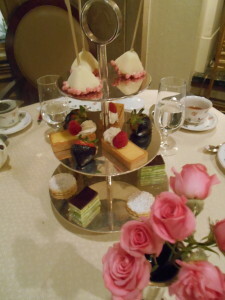 The stars of the tea were the desserts. shortbread cookie sandwiches with a strawberry jam filling and dusted with powdered sugar. My absolute favorite was the cheesecake pop. 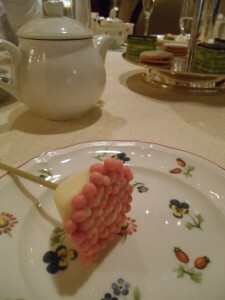 It had a hard white chocolate icing shell and a truffle like center with little round strawberry sugar pearls on the bottom. The little sugar pearls had a rice krispy crunchy texture. 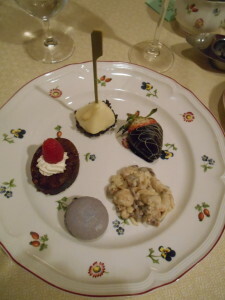 The gluten free option included a flourless chocolate torte, white chocolate covered mixed nuts and dates, and a macaroon. When you go to the Peabody be sure to catch the March of the Ducks. They put on a remarkable show every day at 11:00 and at 5:00. It is not to be missed so you may want to stake out a table in the lobby early. The Peabody is famous for their ducks. Celebrating their ducks, they have ducks everywhere – in the marble floor in the elevator, their soaps, their linens, and their cookies but duck is not served in any of their restaurants – including their afternoon tea.